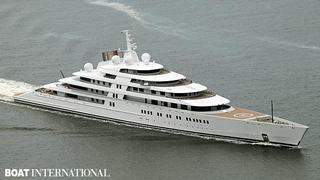 When the largest superyacht in the world – the 180m Azzam – was launched in April, it was speculated she'd begin sea trials in June. And right on schedule, the impressive giant left Lürssen early this morning. At the moment, she is still doing rounds in the North Sea, approximately 50 nautical miles off Bremerhaven, Germany.